On a visually compelling landscape outside Mexico City, Schmidt-Curley Design, a leading golf course architectural firm, is at work on a new master-planned golf community called Amanali Country Club. Schmidt-Curley celebrated the opening of the front nine holes and practice facility at Mexico’s Amanali Country last July. The back nine of the 18-hole, par-72, 7,100-yard golf course is currently under construction, as are a clubhouse, tennis and fitness center, and marina. Located less than one hour north of Mexico City in Tepeji del Rio, the course is routed through a high-desert landscape of cactus and Mesquite. Dramatic bunkering, spectacular elevation changes, shots over rugged canyons and sweeping, ever-present views of Lake Tepeji are highlights from Brian Curley and Lead Designer Grant Haserot. Hybrid Bermudagrass was used on the tees, fairways and roughs, while putting surfaces are bentgrass. The drivable par-4, 352-yard ninth embodies the above attributes. With the lake as a backdrop, the gambling golfer can risk a downhill, 285-yard carry over a vegetation-filled gorge to reach the well-bunkered green for a putt at eagle. A more prudent approach, however, may be to drive down the fairway on the right and take bogey out of play. 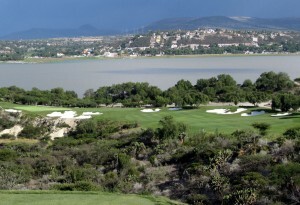 Other current Schmidt-Curley Design projects in Mexico include Ventanas de San Miguel (San Miguel de Allende), Kanai Golf Resort (Playa del Carmen) and Maravia Golf Club (La Paz). Founded by partners Lee Schmidt and Curley with offices in Scottsdale, Ariz., Haikou, Hainan Island, China and Kunming, China, Schmidt-Curley is a full-service, international golf course architecture and master-planning firm with more than 100 layouts in 24 countries, including the U.S., Thailand, China, Vietnam, Mexico, Egypt, Sweden and Korea. The tandem is responsible for crafting 10 of the 12 courses at storied Mission Hills Shenzhen — the “World’s Largest Golf Club,” as accredited by Guinness World Records.